The Bernese Mountain Dog is a working breed originally developed in the region of Bern, Switzerland. 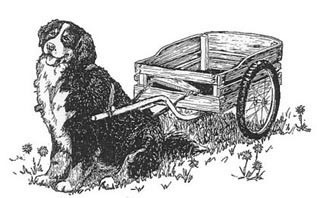 Berners (as they are commonly known) were originally used as farm dogs—guarding and driving cattle, and pulling milk and cheese carts to and from market. Their Swiss name, Berner Sennenhund, underscores the breed's working traditions. A "Senn" or "Senner" is the stockman who takes the cattle to the Alps in the summer and stays with them, milking them, caring for them, and making cheese. The Sennenhund is the dog accompanying the Senner on his Alpine journeys, from farm, to field, and to town. In addition to Bernese, other breeds have also been used throughout history in a similar capacity. Such breeds as Newfoundland, Greater Swiss and others have traditionally been used as draft dogs. Many of the northern and arctic breeds were bred specifically for pulling sleds over the frozen tundra. Today, these jobs have mostly all been replaced by more modern means of transportation. But the natural instinct and ability lie waiting in each of our dogs, ready to be awakened with the command to pull. Our working dogs are happiest when doing anything with their people. Carting and sledding are perfect activities to accomplish this and have fun at the same time. Other than the obvious benefits to heart and lungs for both you and your dogs, draft work can be both fun and useful. Your child can use the dog and cart to help on his newspaper route. You can have the dog pull the groceries home. In the country, a Berner can haul firewood back to the house, or in the suburbs he can help out in the yard or haul the garbage out to the curb. What better publicity for your breed of dog than seeing a well trained team in a parade or at a special event? For those interested in Therapy Work, a dog pulling a cart or wagon full of toys through a children's hospital will result in many happy smiles. Sled dog teams can be registered with local police departments to help transport people and supplies. What better reasons could you have for training your dog for draft work in today's world?